And we’re back! After a bit of a hiccup last week, dip buyers showed up with gusto across most parts of the market. So it looks like the short-term tug-of-war is set to continue. But with plenty of breakouts still setting up under the surface, I’m content to keep taking careful and well-managed bets on the long side. And in this weekend’s blog post I’m excited to show you some of my favourite charts that are acting strong. Okay now before we get into some specific stock charts, let’s take a step back and review the top-down trading environment first. 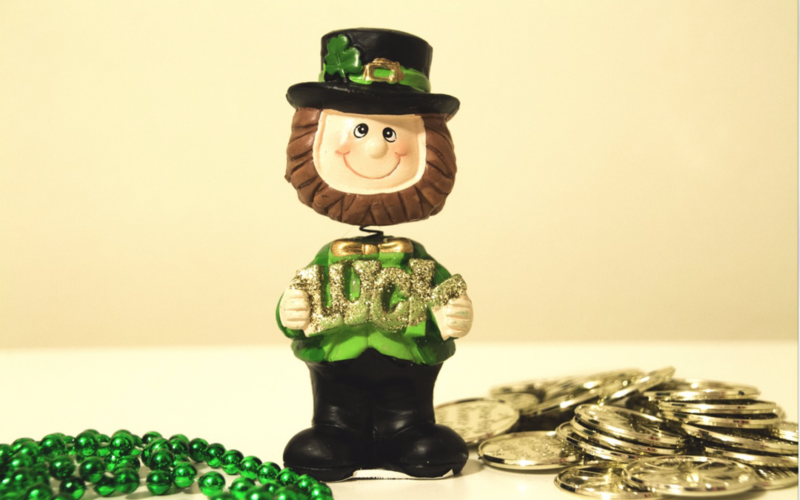 Because by getting a sense for where the indexes are right now, and how they’ve been acting recently, we can better key into pockets of strength and step aside should things look precarious. Lucky for bulls though, the action this week was pretty broad based. After a very strong start to the year in January and February, the month of March has been a little slower to get going. But even though it started on a soft note, things seem to have bounced back a little bit here. And as I mentioned at the outset, pretty much all markets participated in the upside with gains broadly distributed. 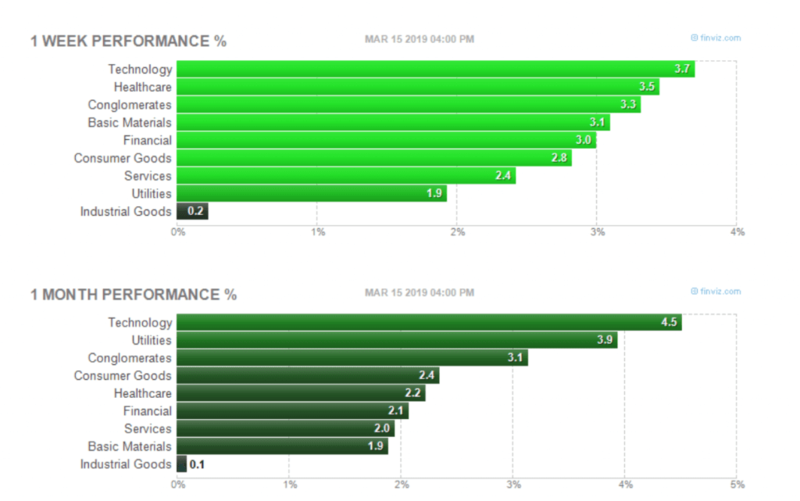 Here’s the sector performance from FinViz. 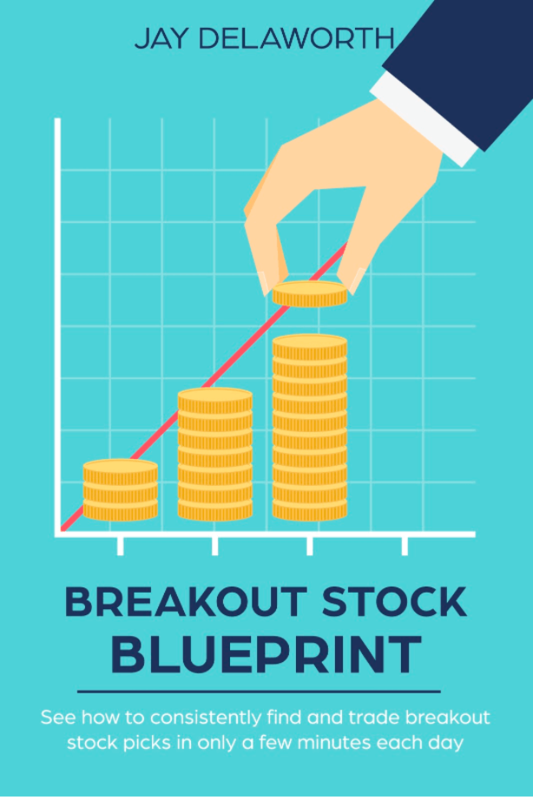 So if you were buying last week, your stocks probably went up! And in fact, this has actually been the case for most over the last month (industrials notwithstanding – but even they have managed to avoid going backwards). So at a glance, it’s hard to argue the case for momentum isn’t higher. 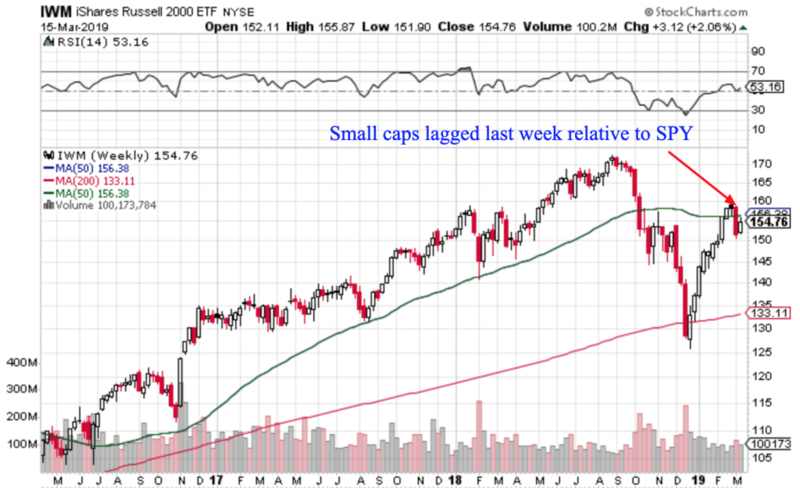 After all, most stocks finished the week on a strong note, we’re back above key moving averages and large caps are once again setting up to challenge their all-time highs. At this point then, my biggest concern is actually at the small-market-cap side of the equity universe. Because although this group was still positive over the last five days, they lagged quite noticeably. So this is one potential area of concern I’ll be watching in the week ahead. The reason I’m paying such close attention is because small caps actually led on the way down during the last market correction. If this does prove to be a lower high I’ll get much more cautious in a hurry. Until there’s more sustained weakness though, I continue to give the slight edge to bulls. On the longer-term it’s still quite a trend-less environment though so manage risk carefully with position sizing and a plan to sell. 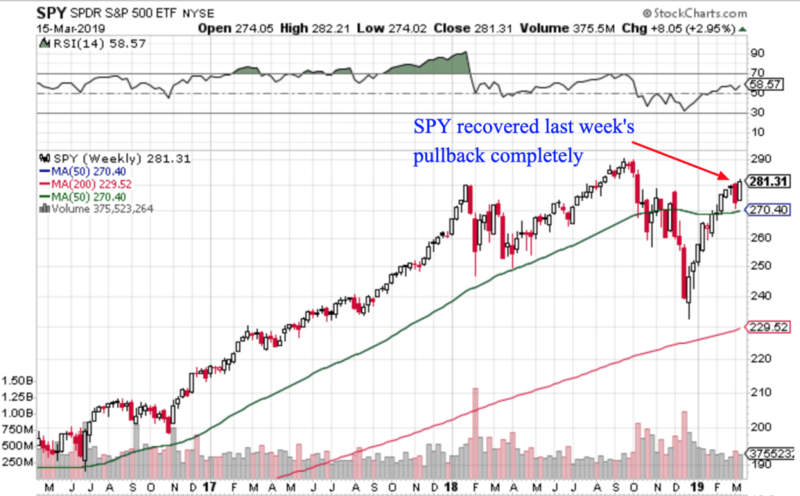 With SPY acting well right now, I want to start off this week with a couple of large-cap ideas that look to be leading the market higher (or about to assume some leadership). 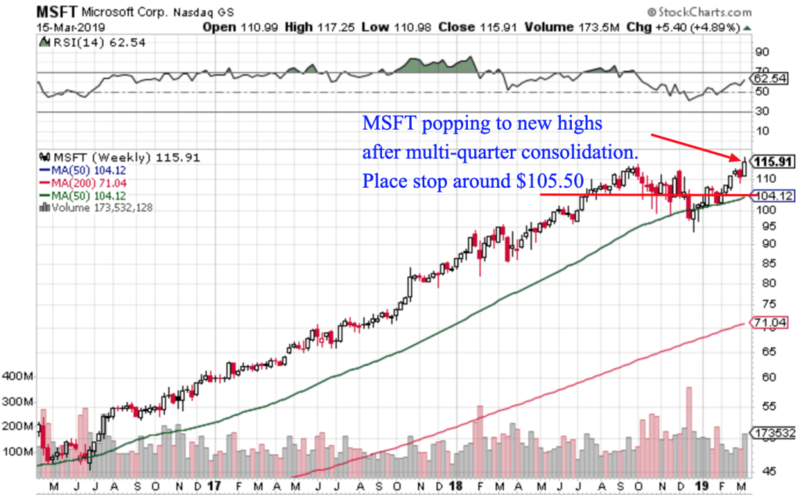 The first example is Microsoft (MSFT), which was a stock that acted well throughout the majority of the week. Take a look at the weekly chart below. The other thing I like about this chart is not only is the long-term uptrend reasserting itself, but it’s doing so after a long sideways consolidation. With this reset out of the way, could we be ready for another leg higher? 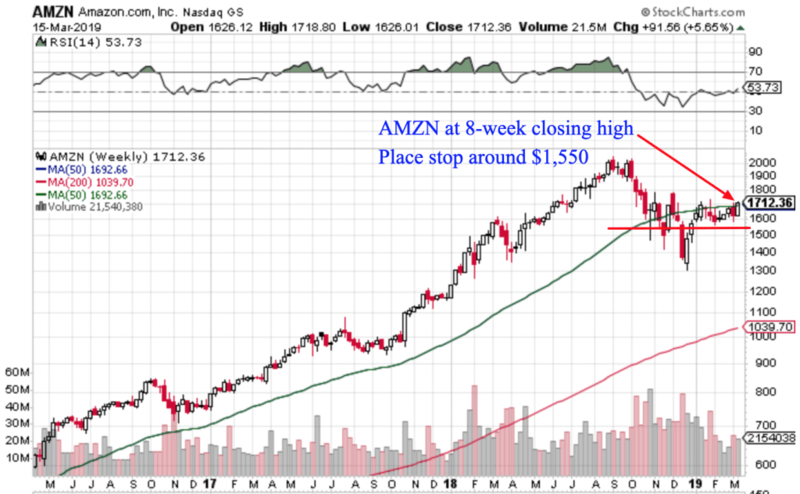 Along the same lines, another large cap stock that has my attention right now is Amazon (AMZN). It’s been lagging on a relative basis but ended the week on a good note. I think the risk/reward here is pretty good and am tempted to start a position in this stock market giant. 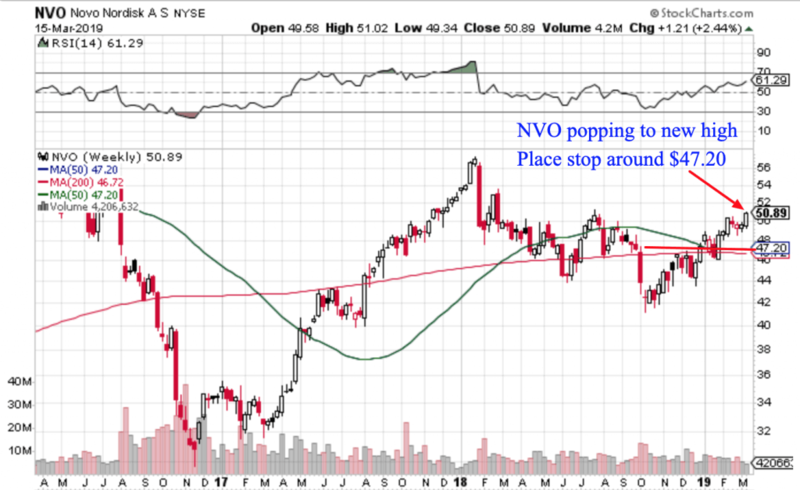 Now moving beyond large-cap tech, I also want to share a few of my current trend following portfolios that are perking up to new highs and signalling fresh entries. Once again, this is a chart that looks to have some momentum and potential, without being too extended. 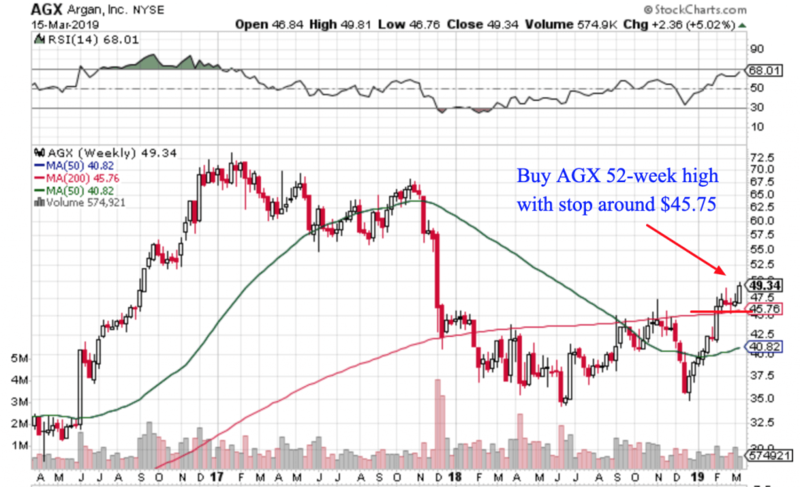 Another chart with a similar look and feel is Argan (AGX), which has just poked up to a new 52-week closing high without being stretched to the upside either. One of the things I really like here is how the chart has a lot of space until the next level of big overhead resistance (probably around $57.50). So I’m hoping this gap can keep filling.